Free delivery and discount codes for use when buying flowers, hampers, plants and gifts at Bunches.co.uk. 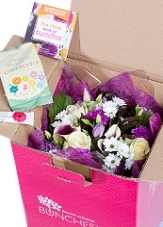 Get flowers by post from only £12.99 with free chocolates and free delivery on all orders. Save 10% off orders every month with bunches flowers bushey. Order before 4pm Monday to Friday for next day delivery. With free delivery on all flower orders throughout the UK. T&C’s: Not valid on Flowers for a Year package or monthly flower gift subscriptions. Bunches.co.uk is a supplier of online flowers, gifts and plants based in the UK. The Bunches website is bright and vibrant with regular offers and deals especially around the annual occasions including Mother’s Day, Valentine’s Day, Christmas and Easter. They offer great value flowers, free UK delivery and free chocolates with all orders. No pop ups, or confusing graphics, that’s the first impressions when loading up bunches.co.uk. I would say perfect colouring for a floral website in lilac and green it grabs you right away. OK let’s look closer at the layout. The main menu directs users to all the main product categories. Contact telephone number catches the eye on the top level information bar, nice to see a number you can ring. If you are looking for a promotion or saving the main offer is posted on a eye catching banner right above the fold of the home page. For quick buying of popular flowers the best seller and most purchased bouquets are shown as a feature in full view of the homepage. Scrolling down the page the main categories and occasions are shown in bunches of 4 banners to give a sneak preview. The footer area has a mass of information the best being the full contact details on the very left without the need to visit a separate page. Next along is the help and information links which seem comprehensive and clear. Once again there’s no need to navigate off the page for delivery information, it’s right there as a summary. All flowers are available with free delivery plus other options subject to an extra charge. Let’s have a look at the purchasing. Clicking on a product brings up a page showing the full description, free offers and delivery information and size options. Clicking ‘continue’ allows you to pick a delivery date plus additional delivery options. There is a free delivery choice or an option to upgrade at an extra cost. Clicking ‘place order’ takes you to a page for a card and message which is an extra cost. The next page is filled with optional extras which are a little overwhelming but you can ignore and continue on. OK we’re finally at the checkout summary where voucher codes can be added if required. Payment options are via credit and debit card or Paypal. The Google certified shop logo gives visitors a feeling of reassurance and added security. Bunches.co.uk has an array of social network pages including Facebook, Twitter and Instagram. To conclude there’s very little to complain about with the appearance and functionality of the site. No surprises and easy to follow menus help guide users through without too much confusion.